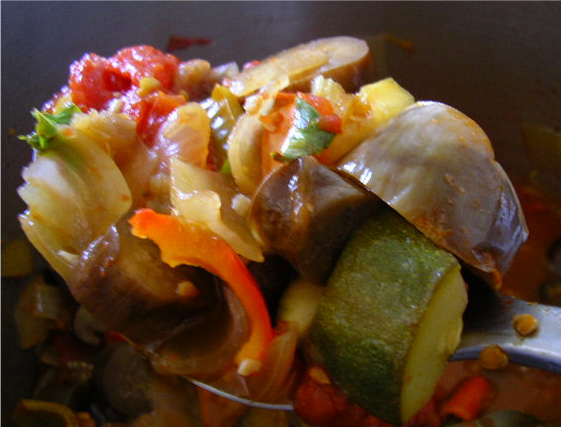 Ratatouille is a vegetable stew that originated in France. Like many stews, the proportions can be tweaked depending on what you have at hand. I have been making a few pots of Ratatouille and freezing it in one quart containers. It's wonderful served with warm French Bread, or spooned over Papperadelle pasta and garnished with curls of fresh Parmesan cheese. Fettuccine or linguine also make a good choice when topped with this lovely mixture of stewed vegetables. 1. Pour 3-4 Tablespoons olive oil in a large, heavy bottomed pot and heat over medium. Coarsely chop two large onions. 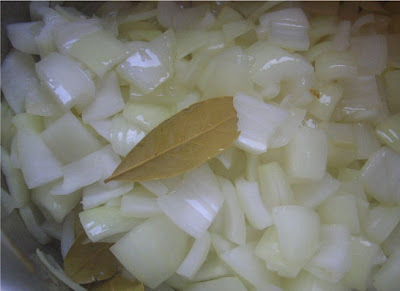 Add onions to pot with 2 bay leaves, and 4 minced cloves of garlic. Sauté for a few minutes. 2. Cut 5-6 small or 1 medium eggplant into 1" pieces. Add to onions. Cook 7-8 minutes while stirring. Turn down heat if things begin to brown too much. 3. 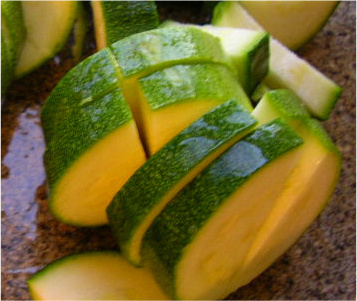 Cut one medium zucchini in half and then thickly slice into half- moon shaped pieces. 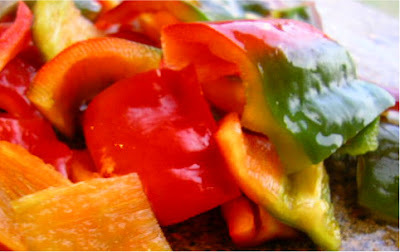 Coarsely chop 2-3 red/yellow/ and/or green peppers. Add zucchini and peppers to onions. Cook for another 7-8 minutes. 4. 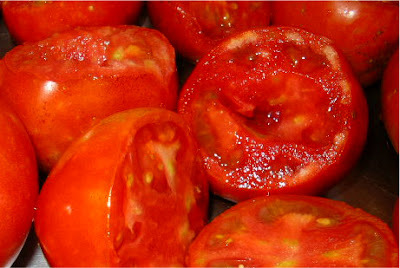 Coarsely chop 6 plum tomatoes or 4 regular (peel first, if you want). Add to pot and stir. Add about a teaspoon of salt. Cook 6-8 minutes. Veggies should be softening, but not mushy. 5. 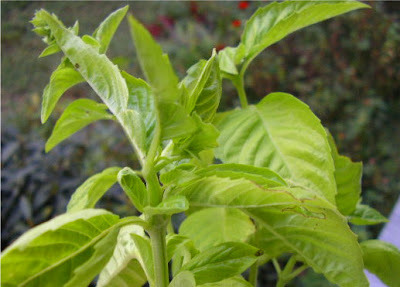 Cut fresh basil leaves into thin strips (shred) to make 1/4 to 1/3 cup. Stir into the vegetables. You can add ground red pepper if you wish. Some folks like to add a splash of red wine vinegar or a touch of fresh thyme. Adding mushrooms when you add the eggplant works great. Especially the Baby Bella (Portabella) kind! It's your Ratatouille. Take command and add what you like. The portions of vegetables vary each time I make it according to what I have, but it always comes out yummy! Oops, I mean Bon Appetit! Came by to ask if you have a smaller button? I am updating my 'In the Spotlight' section but your button isn't fitting in the box. If you have another button (preferably one that is 125*125) I can update it in the box. Oh my goodnes... that looks delicious! 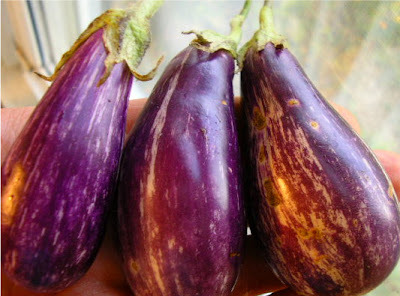 I love eggplant in stew! And add zucchini... oh my goodness!!! I have to try this! That looks very tastie, but me being a dog and all might just put a little meat in it. So pleased you saw a WT, are you sure it was cus peeps keep thinking I'm a Aire Dale! !